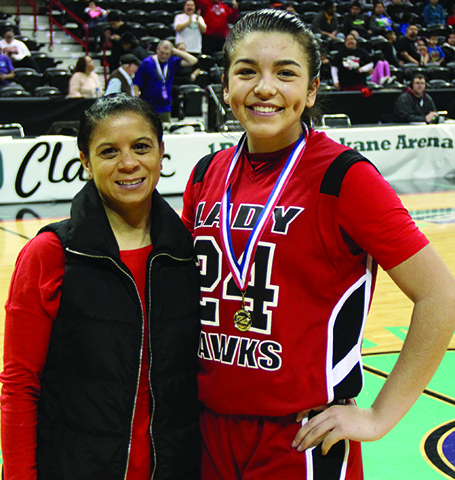 On Friday, March 4, the Tulalip Heritage Lady Hawks (23-2) played a loser-out game in the State tournament held at Spokane Arena. 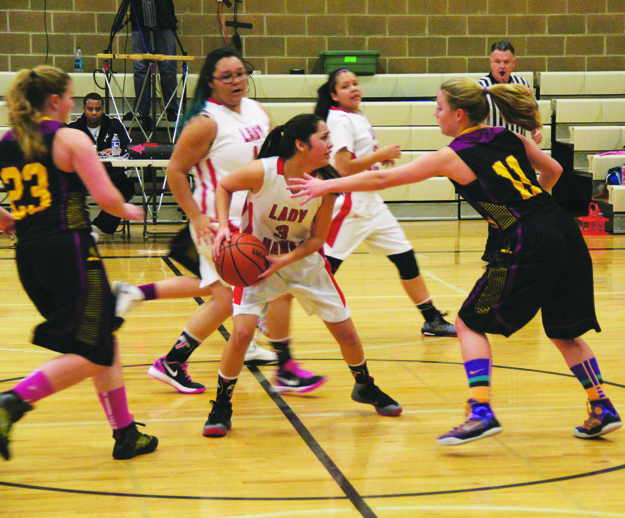 Their opponent was the Warriors from Almira-Coulee-Hartline. In the 1st quarter, Adiya Jones came out very aggressive and scored on three of her first four shots. Tied at 6-6, the Warriors started double teaming Adiya as much as possible, which put the clamps on the Lady Hawks offense. 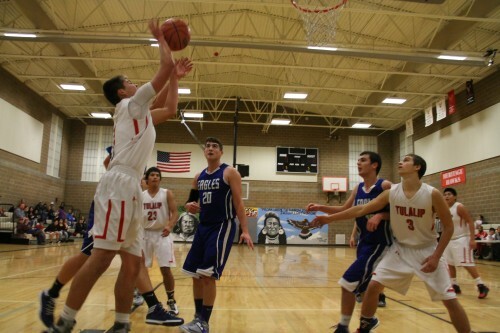 The Warriors finished the quarter on a 12-2 run to take an 18-8 lead over Tulalip. In the 2nd quarter, the Lady Hawks went on a 10-4 run sparked by Aliya Jones connecting on a 3-pointer and a long two, then Adiya added a couple free-throws and a 3-pointer of her own. Trailing by only 4 points, 18-22, the Lady Hawks put enough pressure on the Warriors that they called a timeout. Following the timeout, the Warriors again adjusted their defense to pick up Aliya at half-court and pressured her to give up the ball. The Warriors adjustment worked as the Lady Hawks were unable to get their offense going to close the half and were trailing 22-30 at the intermission. 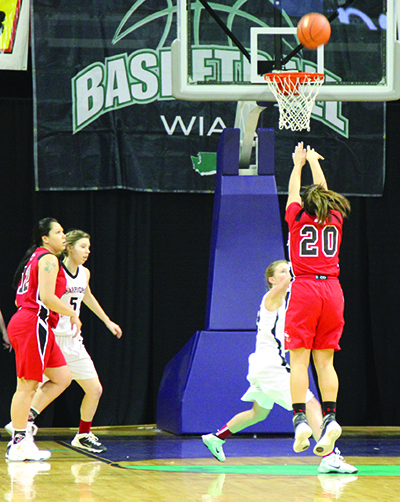 The Warriors ability to disrupt the Lady Hawks offense by forcing turnovers, corralling seemingly every rebound, and using their own size and athleticism to score on the Tulalip defense proved to be too much to overcome. The Lady Hawks lost the game 43-64, ending their season. Adiya finished her last high school game again filling the box score with 27 points, 11 rebounds, 4 assists, 1 steal and 6 blocks. Even more impressive, Adiya scored or assisted on 37 of the teams 43 points. Aliya added 9 points, Keryn 5 points, and Desirae 2 points. This season was a tremendous success for the Lady Hawks. After a season to forget last year, in which the team went 2-18, the program added the talents of Aliya, Keryn and all-state selection Adiya. 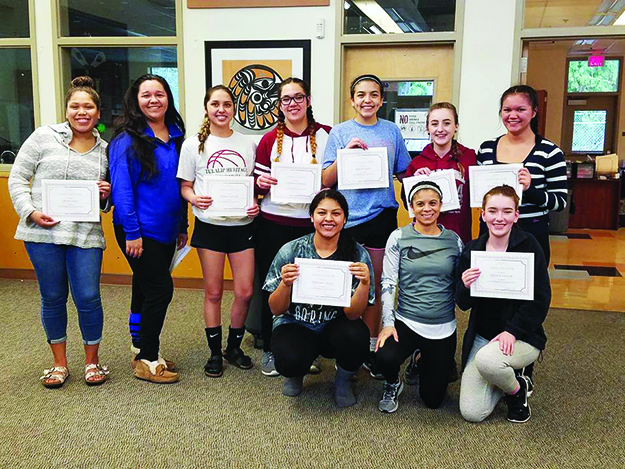 With a renewed vigor the Lady Hawks power housed through their regular season schedule going undefeated and winning by a whopping 30 points per game. They won their league, finished 2nd at Tri-Districts, and were one of only eight teams to play for the State title. Senior players Adiya Jones, Michelle Iukes, Desirae Williams, Kaenishia Herrera, and Geri Iukes will be graduating this spring. Shown below, Adiya Jones and Keryn Parks were recipients of the Hardwood Classic sportsmanship award for their play at State. The Marysville School District (MSD) began a new one-to-one initiative that will span the entire month of October and put a Chromebook computer in the hands of more than 5,500 students in grades 6 through 12. 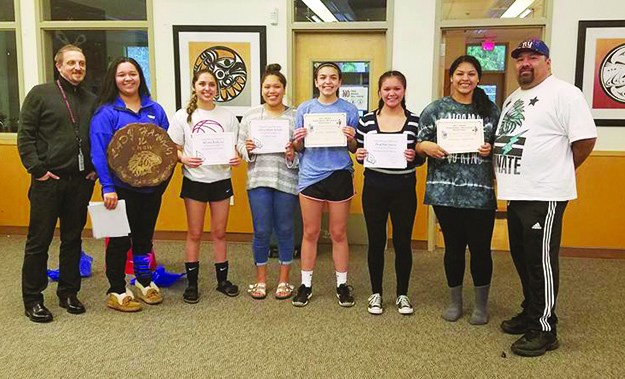 As part of the roll-out, Tulalip Heritage High School was the first school chosen to receive the latest and greatest generation of HP Chromebooks. With the lightning fast Chrome OS, 8-second boot-up time, and over eight hours of battery life, the Chromebooks provide the versatility teachers need and the technology students want. According to an MSD press release, the devices are fully funded by a technology levy approved by district voters in 2014. Preparations for the Chromebook initiative began with last year’s upgrade of the district’s wireless Internet infrastructure. Since then, MSD partnered with a local Marysville company, Advanced Classroom Technologies, to install more than 60 miles of network cabling. The system went live in March 2015, and now all district facilities have Wi-Fi available to the students and community during non-school hours. So whether you are at school campus to watch a sporting event, attending an afterhours activity, or just sticking around to do homework or research, you can now connect to a free, public Wi-Fi that becomes available at the end of the school day. This is a huge benefit for students and their fellow community members who don’t have an available internet connection at home. Students will be allowed to take and use the Chromebook devices at home following the school day and use them on home or public Internet connections. Even if they’re used outside of the district, the devices have built-in content filtering as required by law. The Chromebooks initiative will change the instructional learning environment for the students at Heritage, while keeping information and their resources constantly up-to-date. Think of how people generally learn new methods and strategies in today’s digital era. We will search Google, Wikipedia or YouTube to learn something in the moment. Moving away from the traditional model of teachers as ‘the fountains of knowledge’, MSD wants the students to be more independent and active in their knowledge development. Students will no longer have to rely necessary on their teacher or an outdated textbook to deliver content anymore. Instead, teachers will be facilitating use of the ever-expanding wealth of knowledge available via Chromebooks. Scott Beebe, MSD Technology Directory, says 140 teachers received professional development training (e.g. productive internet searching, learning Google Apps, basic troubleshooting) in August on how to use the Chromebooks in the classroom, and about 150 more will be trained throughout the month of October. The professional development will focus on learning to design lessons that not only empower and engage students in compelling work, but also leverage the power of technology to connect people and ideas. Heritage students and teachers alike agree the one-to-one Chromebooks initiative benefits everyone. Students are able to do their work more efficiently and have no difficulty submitting assignments with the Google Docs app, while teachers no longer have to try to decipher student handwriting and can edit assignments and provide immediate feedback to students individually. Heritage High School has never had a library or computer lab that is accessible to students furthering their learning like other high schools in the district. The Chromebooks bring a world wide web of books and other resources to their hands now. With such rapid investment in communication devices, wide-scale wireless network, and professional development, student learning is clearly on center stage. The Chromebooks initiative will help students achieve more academically, perform better on tests and be in a better position when it comes to computing in the collaborative online environments of today’s digital era. Students in the video production class get hands-on experience working with cameras and conducting interviews. 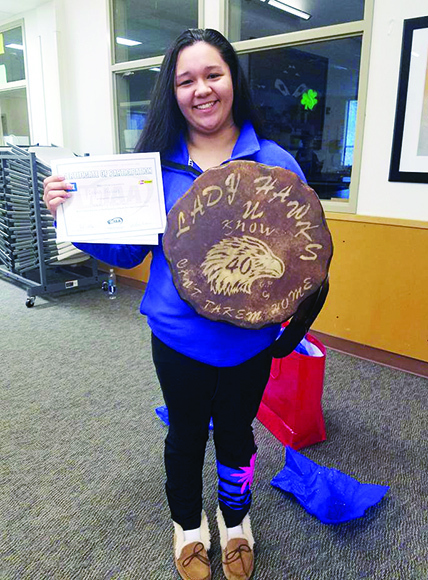 Students at Tulalip Heritage High School were given the opportunity to experience different types of art in a program called Artists in Residency (AIR). Eight artists from the area came to the school to instruct students in a fourteen-week course, giving each student an option to learn, create, and perform two different types of art. The art classes offered were cedar weaving, carving, yoga, pow wow 101, Native American flute making/playing and video production. The teachings from each instructor allowed students a hands-on and individualized experience. Shelly Lacy, the principal at Heritage, explained that the students not only learn the craft that the artist is sharing, but they learn traditional teachings as well. 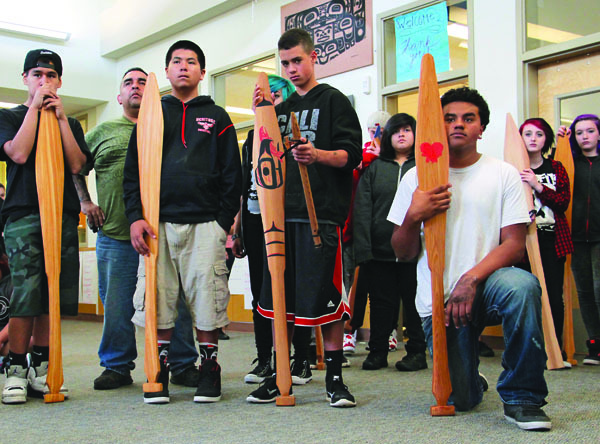 Heritage students with the paddles they made during carving class. 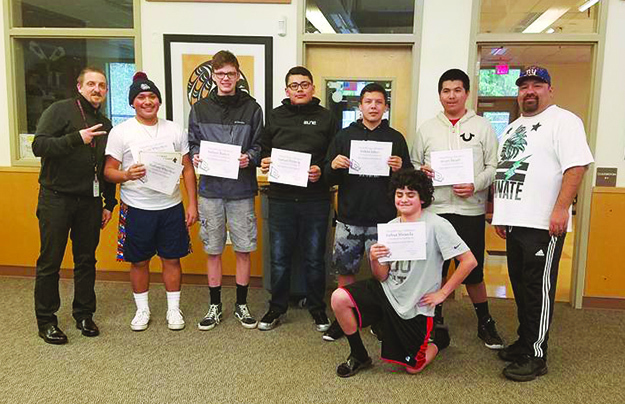 The video production class, instructed by Brian Berry and Rick Valentine, video producers from the Tulalip Tribes Communications Department, introduced students to the basics of video production and film making and then progressed into some of the more technical aspects. Students learned about framing, lighting, b-roll, audio, and editing. They were also taught how to interview people and operate a high definition video camera. Nina Fryberg, a senior at Heritage, talked about why she chose video production. “At first I decided to take yoga and cedar weaving, but I asked to switch into film-making for both periods instead.” Fryberg had experience working on a short-film last year in another program, which helped with her decision to participate in video production this year. 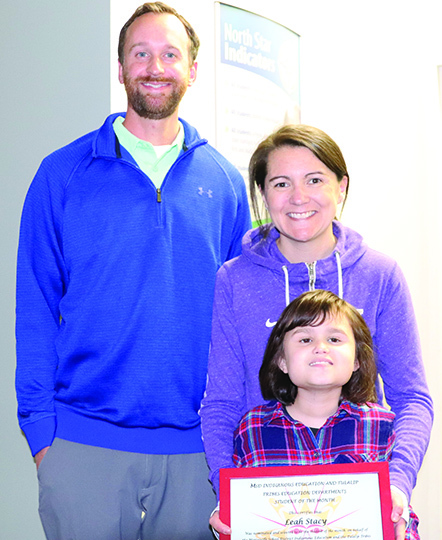 She also earned a position as a student producer, which allowed her to give other students instructions and tell them which crew positions they were assigned to. Berry explains that students weren’t selected as producers, but that they more or less “earn the position by showing a significant level of initiative and attention.” Student producers also run the productions and make editing decisions. “It takes a lot of effort to put into film-making. You have to plan everything out and make sure everything is okay and ready to go before you start filming” said Fryberg. In the final weeks, students in each class finished their projects and prepared to perform for the other students, instructors and faculty members. 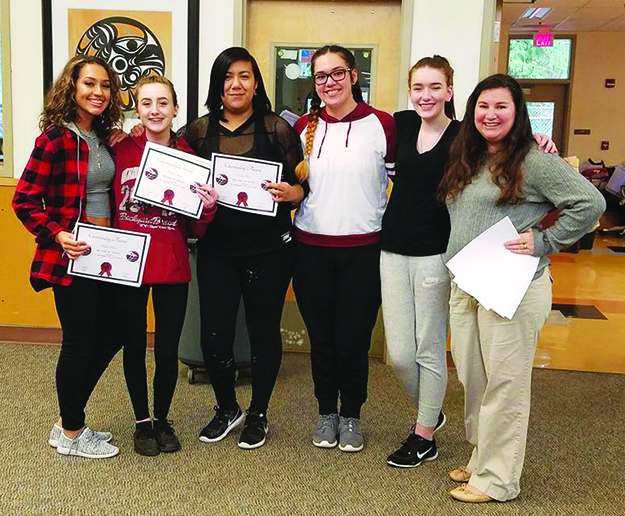 The video production class created a short film, “Heritage High School – A Small Learning Community” which previewed on May 15th, about what makes Tulalip Heritage High School unique and why students chose Heritage over other schools in the district. The video was a product of what the students learned over the course of 14 weeks. “The student body, faculty and fellow AIR artists screened the video and it received a round of applause and cheers” said Berry. 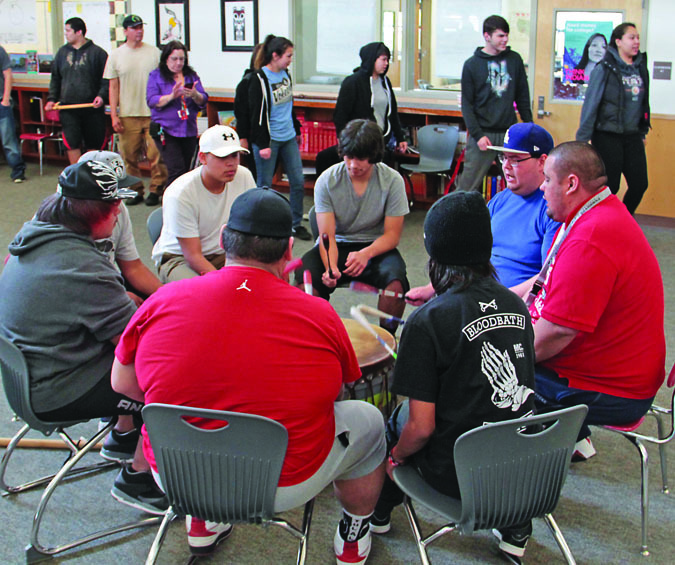 Students from the Pow Wow 101 class perform for students and faculty. The six additional artists who shared their gifts, teachings, knowledge, and talent with the students were Clarissa Johnny, Kelly Moses, Mytyl Hernandez, Ian LaFontaine, Sheri Thunder Hawk and Paul Wagner. “Heritage High School – A Small Learning Community”can be watched on demand at tulaliptv.com and found in the Tulalip Culture section of the main menu. 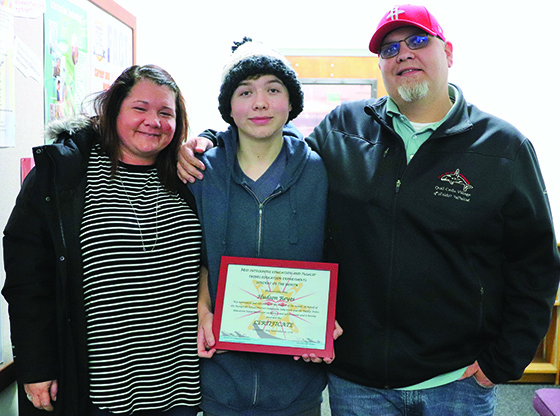 The video will also be included in the May 25th edition of Tulalip Matters, which will air daily for a week, beginning May 25, on Tulalip TV channel 99, at 12: a.m., 8:00 a.m., 12:00 p.m., and 5:00 p.m.
Tulalip Matters can also be viewed anytime, on demand, at tulaliptv.com. 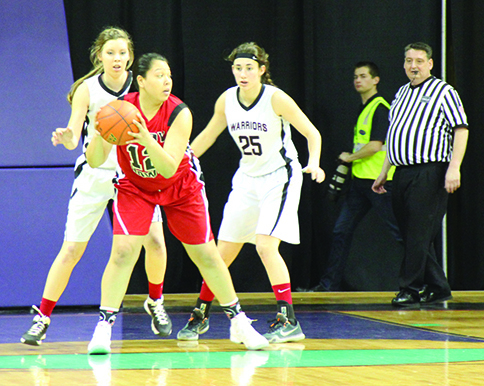 Guard Myrna Red Leaf looks to pass the ball against the vaunted Grace Academy defense. 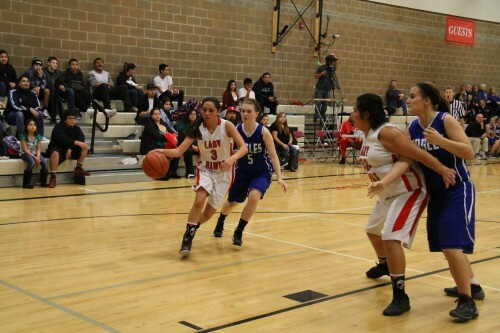 Coming off their first win of the season, the (1-11) Lady Hawks were looking to keep the momentum going when they hosted the (7-2) Orcas Christian Saints on January 13. The Lady Hawks had two new players making their home debut, sophomore center #40 Cyena Fryberg and junior guard #2 Kaenisha Herrera, giving the team eight active players for the first time all season. The 1st quarter started off well as forward Jaylin Rivera collected an offensive rebound and scored off her putback field goal. Two possessions later guard Michelle Iukes made a 3-pointer to tie the game at 5-5. 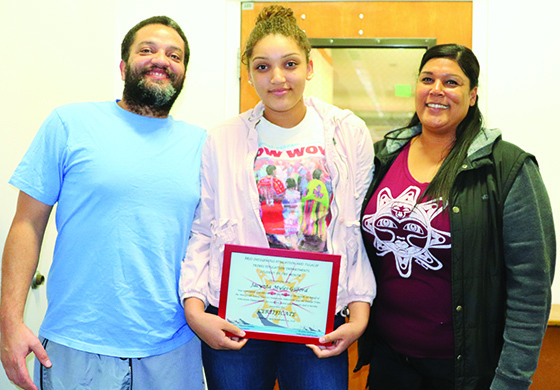 The team’s momentum then was halted as Orcas Christian switched into their ‘diamond defense’ that calls for full-court trapping of any Lady Hawk ball handler. 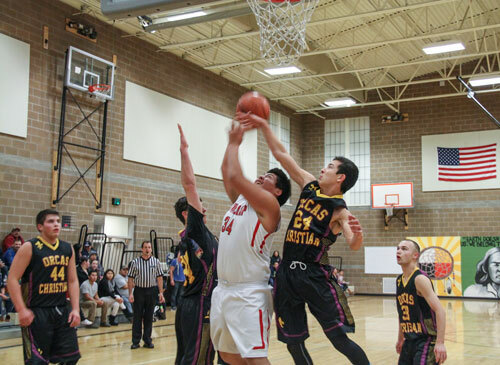 The Orcas Christian defense forced seven turnovers and allowed the Saints to go on a 7-0 run to end the quarter. Starting the 2nd quarter the Lady Hawks trailed 5-12. 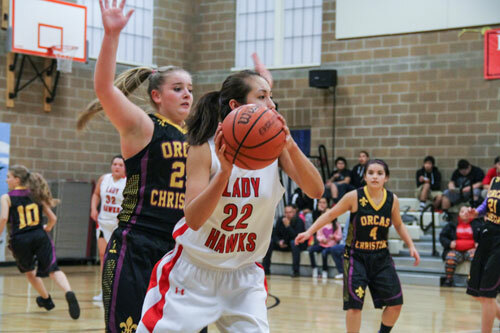 Orcas Christian continued to implement their ‘diamond defense’, forcing ten more Lady Hawk turnovers. 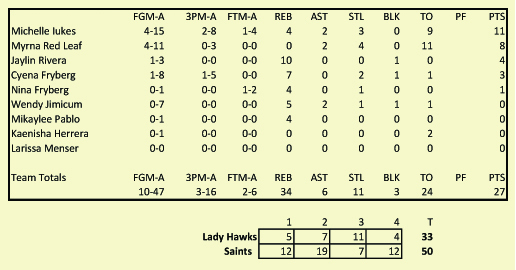 When the Lady Hawks were able to break the Saints’ pressure and advance the ball to the frontcourt they were able to get quality looks at the basket. 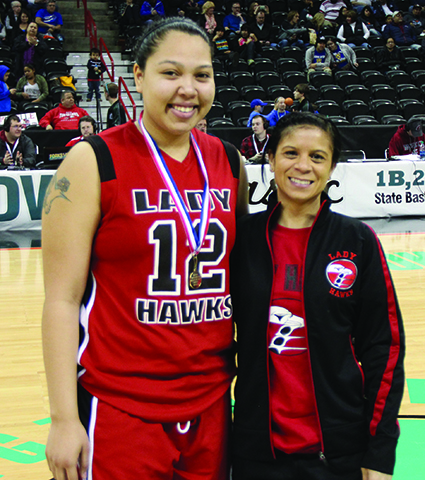 Point guard Myrna Red Leaf made two jumpers and Iukes nailed a deep 2-pointer and a free throw to give the Lady Hawks 7 points in the quarter. However, on the other side the Saints were getting easy looks from their forced turnovers and scored 19 points in the quarter. At halftime the Lady Hawks trailed 12-31. During the 3rd quarter the Saints stopped playing their ‘diamond defense’ and went to a more typical half-court press. The Lady Hawks were able to advance the ball quickly and break down that defense, especially for their 3-point shooters. Both Cyena Fryberg and Iukes were able to get open and make a 3-point shot, followed by a pair of made free-throws by forward Jaylin Rivera. When Red Leaf hit her 2-point jumper the Lady Hawks had gone an 11-2 run to win the 3rd quarter 11-7. With more quarter remaining the Lady Hawks cut their deficit to 15 points, 23-38. Red Leaf and Iukes connected on back-to-back jumpers following a Saints’ made free throw to open the 4th quarter. Their buckets pulled them within 12, 27-39 with 5:00 to play. Unfortunately, that was all the offense the Lady Hawks would get in the final quarter as the Saints closed the game on an 11-0 run. The Lady Hawks lost 27-50, but would be encouraged by their play in the 3rd quarter as a sign of how good they are capable of playing.